Categories: Autumn, Featured Plants, I-L, New Plants for 2019, Plants A-Z, Plants by Season, Plants In Situ, Summer, The Bog Garden and Bank, The Cool Border, The Yellow Garden. 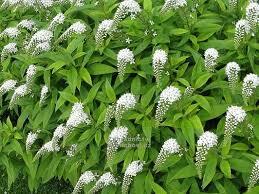 Gooseneck loosestrife, Lysimachia clethroides, is a fast-growing clump-forming perennial, bearing fresh green, pointed leaves, which turn orange-red briefly before falling in autumn. Its saucer-shaped flowers grow on long, slender arching spikes, reminiscent of a goose neck. It’s perfect for growing in a mixed herbaceous border, where its flowers will attract a wealth of insects. Grow Lysimachia clethroides in humus-rich, moist soil in full sun or partial shade. It may need support. Cut back after flowering and dig up new shoots to control its spread.